We’d love your help. Let us know what’s wrong with this preview of Today and Tomorrow and ... by Isaac Asimov. Here are thirty-two science essays written for a variety of publications over a six year period and all updated. Interesting to look back, thirty-five years on, to the major challenges envisaged on how to deal with developments in outer space as well as on earth. To ask other readers questions about Today and Tomorrow and ..., please sign up. 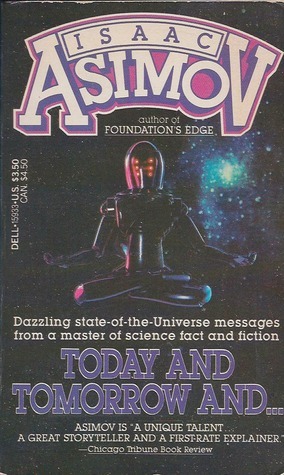 Yes most of the essays are dated, BUT one can recognize and appreciate the forward thinking of Dr. Asimov. I recommend reading “What Do You Call a Platypus” and “How Many Inches in a Mile.” They’re both good fun. SF fans will enjoy the whiff of cigarette smoke and 60s optimism that wafts out of this little time capsule of non-fiction essays from Isaac Asimov. The weirdness of his thinking makes a few of the essays enjoyable for their content, but most of the pieces in this book are valuable as artifacts of the weird blend of groovy and button down that was pre-cyberpunk American SF in the 60s and 70s. Μια συλλογή από πολύ ενδιαφέροντα άρθρα που έγραψε ο Ασήμοφ πάνω σε διάφορα επιστημονικά (και όχι μόνο) θέματα. Κάποια από αυτά "προβλέπουν" διάφορες τεχνολογικές εξελίξεις με αρκετή ακρίβεια, όπως π.χ. το διαδύκτιο και το κινητό τηλέφωνο. Professor Asimov is generally considered one of the most prolific writers of all time, having written or edited more than 500 books and an estimated 90,000 letters and postcards. He has works published in nine o Isaac Asimov was a Russian-born, American author, a professor of biochemistry, and a highly successful writer, best known for his works of science fiction and for his popular science books.